The Victorian years were the years of the 'Industrial Revolution', when huge new factories and mills were being built in the towns and cities of Britain. They were needed for the new steam-powered machines which could produce goods in large quantities, including products for export to distant countries of the British Empire and beyond. The city of Birmingham in the English midlands was one of the most important centres of the new manufacturing industries at this time. New factories needed lots of workers, and these workers and their families needed places to live close to the factories. The very rapid expansion of the city with cheaply built housing resulted in terribly crowded and unhealthy living conditions for many of the workers in the new factories. 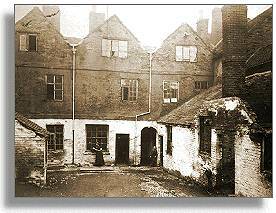 This meant that the slum districts of Birmingham and other industrial centres grew larger, and diseases and epidemics spread very easily among the densely packed population. A major cause of the epidemics was the lack of enough clean water to supply the needs of a much larger population, so the City Council of Birmingham decided in the early 1890's to build a huge system of dams and reservoirs in the Elan Valley. This would provide ample supplies of fresh water to be sent along a huge pipeline over 70 miles long to Birmingham.